Students at Sugar Creek Elementary School thanked the Verona Clinic for supporting their Imagination Fair. 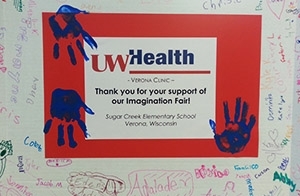 The UW Health Verona Clinic was a big supporter of this year’s Imagination Fair at Verona’s Sugar Creek Elementary School, held April 24, 2015. The Imagination Fair brought together 119 students and their families in a community event that’s part science fair, part book sale and part fundraiser. Resident Eugene Lee, MD, judges science projects at the Sugar Creek Imagination Fair. Recently graduated Madison resident Eugene Lee, MD, along with UW Health Mt. Horeb clinic nurse practitioner Kimberly Glasgow, served as student project judges for the science fair portion of the evening. As part of their sponsorship, the clinic also made a donation to support technology purchases at Sugar Creek Elementary; specifically apps that promote creativity, critical thinking and communication for all children at the school. It’s the second year the clinic has made such a donation. “Sponsoring this event is a great way to connect with our community and also support students’ science interests at the school,” said Mark Shapleigh, Verona clinic manager.